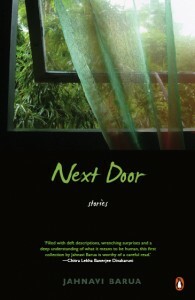 Review of Next Door by Jahnavi Barua, published in 2008 by Penguin India. The mekhla sador made of muga is an apt metaphor for the Assamese short story. Just as muga enriches its sheen after every wash, each subsequent generation of writers, right from the 19th century, refined and expanded the Assamese short story. This, in spite of an irony. The irony is that the theme chosen by all the Assamese short story writers is just one: the social milieu and how it affects the individual. Lakshminath Bezbarua, who may be called the father of the Assamese short story, wrote about the social situation of the time with gentle satire. His approach may suggest that types, not characters, peopled his stories; the contrary was the case. The short stories of his contemporary, Sarat Chandra Goswami, shifted the emphasis from society to individuals. The writers who followed these two father-figures, Nakul Chandra Bhuyan, Haliram Deka, Lakhidhar Sarma, Birinchi Kumar Barua, Roma Das, stayed on the curve between social commentary and individual characterization. The last two writers introduced psychology in their study of individuals. The early writers of the 20th century, Syed Abdul Malik, Sheelabhadra and Birendra Kumar Bhattacharyya extended the scope of the Assamese short story by introducing elements of modernity that paralleled development in this genre in America and Europe. But it was Mahim Bora who became the literary cousin of writers like Kafka, Satre and Camus, with his probing of the human condition. Saurav Kumar Chaliha’s stories extended the range further with experimentation at various levels. The contemporaries of Bora and Chaliha, Homen Borgohain and Bhabendra Nath Saikia, served as counter points to Mahim Bora and Saurav Kumar Chaliha, with their emphasis on naturalism. Social relations were presented through different prisms in the works of Atulananda Goswami, Nagen Saikia, Nirupama Borgohain and Pranav Jyoti Deka. Heightened social concern ran like a thread in the stories of Jehirul Husain and Apurba Sarma. One of the few writers who experimented with the form, as opposed to the content of the Assamese short story, was Harekrishna Deka. Debabrata Das followed Deka’s lead but with a high degree of individuality. Bhupendra Narayan Bhattacharyya tempered the approach of Harekrishna Deka and Debabrata Das with a dose of naturalism. Sibananda Kakati looked back over his shoulder to patterns in rural Assamese life. Arupa Patangia Kalita added element of drama to her stories by keeping description to a minimum. Her contemporaries, Jayanta Kumar Chakraborty and Kula Saikia juggled methods of narration to the readers’ delight. The generation younger to them, Robin Sarma, Bonti Senchowa, Apurba Kumar Saikia, Manoj Kumar Goswami, continued the tradition of literary jugglery. Women writers added a new dimension to the Assamese short story. New perspectives on human nature, a pleasing feminine approach and a different reading of social reality marked the work of Maini Mahanta, Anuradha Sarma Pujari, Nabanita Gogoi, Manikuntala Bhattacharyya, Mousumi Kandali, Anamika Bora, Ratna Bharali Talukdar, Monalisa Saikia, Gitali Bora, Monika Debi. Into this mix, this blossoming of the Assamese short story in all directions – theme, content and approach – recently came a young talented voice sharing the experience of her native land in a foreign language. 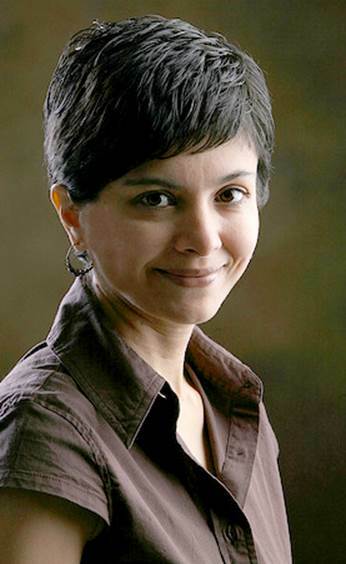 The writer is Jahnavi Barua, a doctor by profession, with her debut collection of short stories entitled Next Door. Maturity is the motif of the collection. There is first of all the maturity of her vision. Though she is young in years, her understanding of life, especially of older people, is uncanny. There is the shadow of decay and death in most of the stories but it does not in any way make them depressive; it is an individual (Jahnavi’s) interpretation of the condition the great Buddha called “suffering”. Then there is the maturity of expression. There are four aspects to this. The obvious one is her command over English. The second one is her choice of titles for the stories. They are not just descriptive. They serve either as a metaphor or encapsulate the theme of a story. The third, the subtle aspect is how she has been able to infuse the rhythms of the Assamese tongue into a foreign language; I’m not referring to just the presence of words like Baido, Dueta, mekhla, sador and the like. The closest comparison I can think of is that of an English person thinking in Assamese. Her comedy, where she chooses to use that medium, is subdued. Dhiren Majumdar is such a wonderful character that I’d love to get into long chat sessions with this man over cups of strong Assam tea. But for me the greatest pleasure was how my adoptive mother, Assam, was brought alive by Jahnavi in the pages of her book. I re-lived the sights and sounds of Assam. The Brahmaputra as wide as the sea. A rhino with a baby by her side. A wild buffalo with massive curved horns. Narrow strips of dank earth, coated with slippery moss, next to an open ditch. I could go on giving example after example. Jahnavi Barua continues in the tradition of the Assamese writers of each generation who, to return to the opening metaphor, added to either the design or introduced a new colour in the border of the mekhla, while allowing the muga to look after its own radiance. Janhavi has added the color of depth, the iceberg of suggestion and a multi-faceted maturity to the border. This review of Next Door by Murli Melwani originally appeared in Indian Book Reviews, Dec 5, 2009.